Cathy our resident Chiropractor with over 10 years experience specialises in helping women throughout pregnancy, during the postnatal recovery period and beyond. Chiropractic works on the simple principle that good spinal alignment leads to better health and less pain. Cathy helps women function optimally so that they can enjoy their pregnancy and the experience of being a Mum to the full. 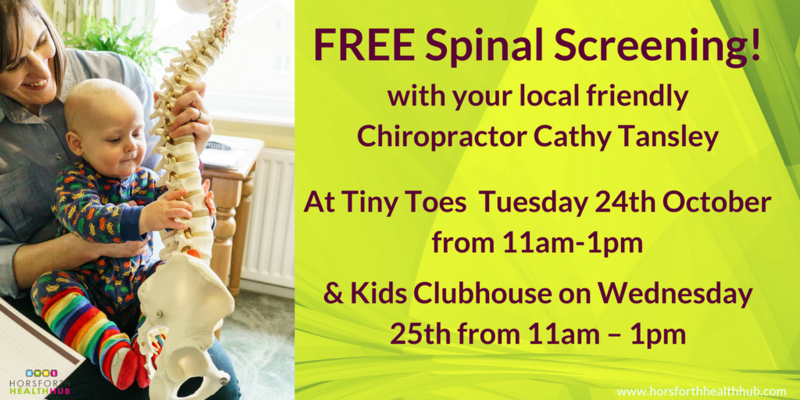 Come along and find out how Chiropractic care could help you at a FREE Spinal Screening coming soon at Tiny Toes on Tuesday 24th October from 11am-1pm and at Kids Clubhouse on Wednesday 25th from 11am – 1pm.